Fifteen years ago, a budding young superstar named Kobe Bryant was quickly becoming one of the most popular players in the NBA. His endorsers over at adidas didn’t skip a beat, establishing a full-fledged signature sneaker line for the Lakers guard by the time his sophomore season rolled around. The line began with the aptly named KB8, which has found a second life in 2005 under the name Crazy 8 and has remained a steady staple of the adidas retro lineup ever since. It’s been a while, but the second Kobe model is finally following in its footsteps, returning to shelves as the “Crazy II.” Continue reading for more information. Although adidas can no longer legally use the Kobe name, the shoes return boasting the same Laker flavor from their heyday. 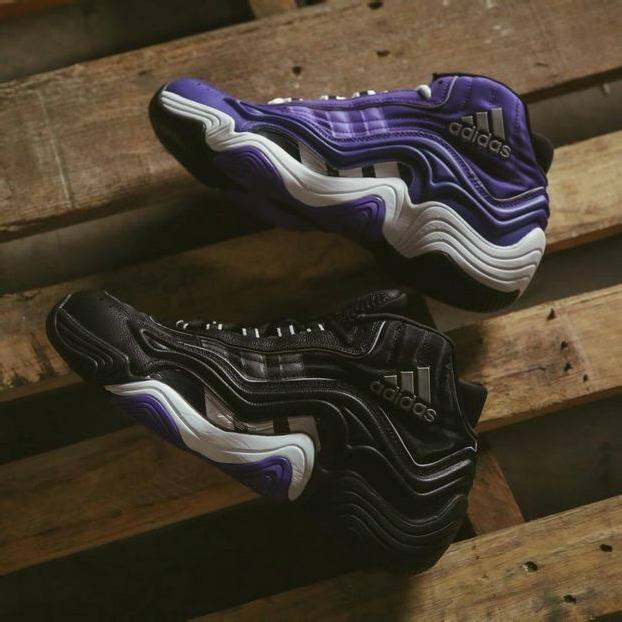 Two original Laker-inspired colorways take the lead: a black-based model with purple accents, and a colorful Power Purple version. The sneaker features a slightly retooled version of the unique Feet You Wear midsole/outsole from the original, plus standard nubuck and synthetic materials on the upper.